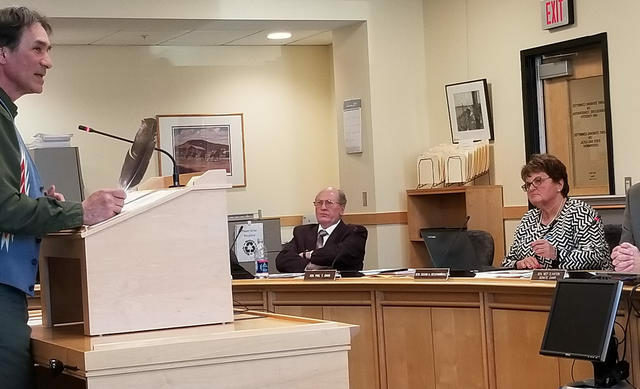 The Maine House of Representatives initially approved a bill on Tuesday that would make the state join several others and a handful of municipalities including Bangor by recognizing the October holiday of Indigenous Peoples Day instead of Columbus Day. AUGUSTA, Maine — The Maine House of Representatives initially approved a bill on Tuesday that would make the state join several others and a handful of municipalities including Bangor by recognizing the October holiday of Indigenous Peoples Day instead of Columbus Day. After the 88-51 vote, a measure sponsored by Rep. Ben Collings, D-Portland, looks to be on track for passage in the Democratic-led Legislature backstopped by Gov. Janet Mills, who has made improving relations with Maine’s Indian tribes a goal during her nascent administration. It faces further action in the House and Senate. A national push to recognize indigenous people on the federal holiday celebrating the Italian explorer Christopher Columbus began in the 1990s. Columbus’ voyages to the Caribbean, South America and Central America under Spain’s auspices between 1492 and 1502 kicked off the European colonization of the New World. At least five states now recognize Indigenous Peoples Day, according to the Associated Press. Several Maine cities and towns also recognize the day. Belfast was the first in the state to do it in 2015 and municipalities including Portland, Bangor and Orono have since followed suit. Tribes and civil liberties groups have hailed the changes nationwide and Italian-American groups have resisted them in other places. Democrats largely backed the bill on Tuesday, and the debate revolved around how to best balance the teaching of European and tribal history. “I would rather encourage all of us to celebrate all of our accomplishments since that time with hopes that we’ve learned enough from our past so similar things will not occur in the future,” said Rep. Roger Reed, R-Carmel, who voted against the bill. Only four Republicans — Reps. Gary Drinkwater of Milford, Tom Martin of Greene, Beth O’Connor of Berwick and Dwayne Prescott of Waterboro — voted for the bill. The only two Democrats to oppose it were Reps. Stephen Stanley of Medway and Bruce White of Waterville.